Cute, pink kitties gaze into a starry sky. The Stargazers Kim’s Sweater features a crewneck, banded hems, contrast lining and a roomy, relaxed body. 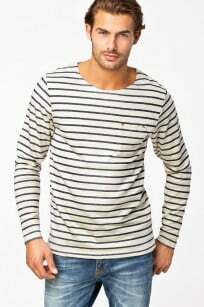 Constructed from a light, burnout terrycloth blend. 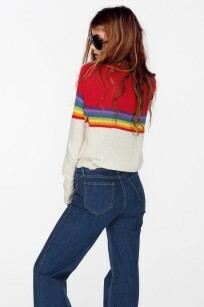 The Ski Lodge Mini 70’s Sweater is inspired by vintage skis, rainbow snowsuits and winter days in log cabins. 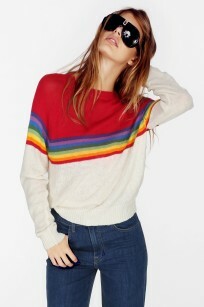 Retro rainbow stripes are knit across a red and white body. 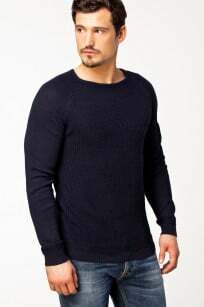 Crewneck, ribbed hems and a smaller fit. Tightly knit from a our team spirit yarn, a soft cotton blend.